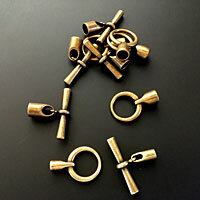 Good quality end clasps for kumihimo braids at a resonable price are hard to find. 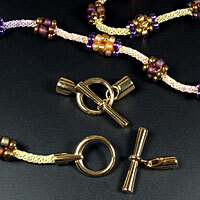 These clasps are irresistable. 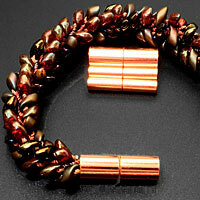 The addition of copper, antique brass tones and oxidized finished is a welcome addition to the gold and silver tone plate. 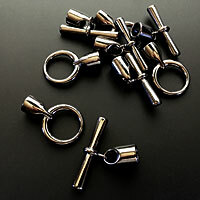 These are glue-in clasps. 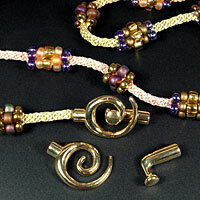 Check the finding page for best way to glue cords and braids into clasps. 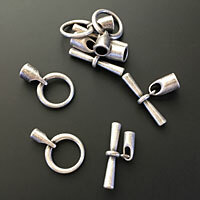 All the findings on this page are lead and nickel-free and EU compliant. 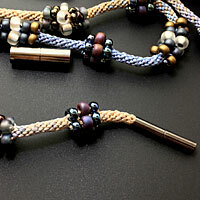 Normally, I prefer sterling silver or gold filled components for my braids & cords, but these end clasps combine good design and great prices. 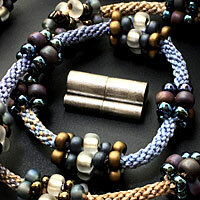 I love all the new finishes especially the antique copper, antique silver, antique brass and black oxide finishes. 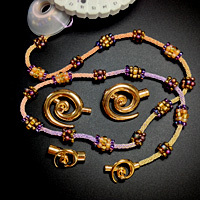 The 3.2 mm inside diameter size works well for an 8 strand round braids done with C-Lon Bead Cord, C-Lon Fine Weight Bead Cord and with the Panaché Ribbon featured in these photos. 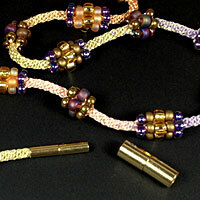 The Kumihimo Bead Cluster Kit is featured in these photos. 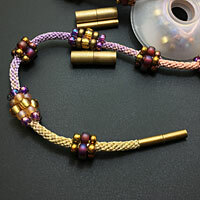 The 6.2 mm inside diameter size works well for an 8 strand round braids done with beaded project done with C-Lon Bead Cord, Chinese Knotting Cord and C-Lon Tex 400 Bead Cord. 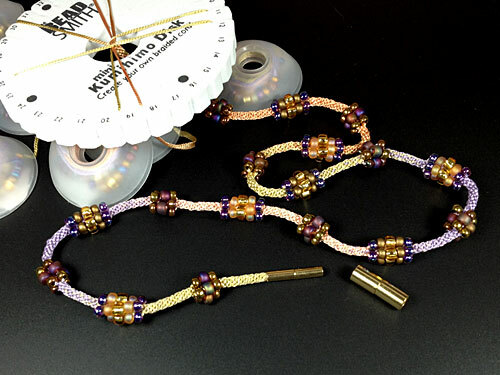 That's the size used with the Kumihimo Bracelet Kit featured in this page > Kumihimo Bracelet with Long Magatamas & C-Lon Bead Cord Tex 400. 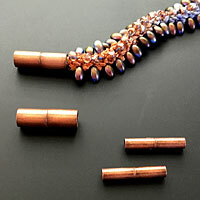 For bracelets, we recommend adding Peyote Sleeves over these magnetic clasps as the magnets seem to prefer other metallic objects to themselves and slide apart to attach to metal posts, chairs stove parts... or use stronger magnetic clasps or Euro Magnetic Clasps. 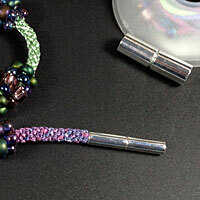 This 3.2mm toggles are used for the Kumihimo Bead Cluster Kit and the 6.2mm toggles are used to Hand Dyed Silk Ribbon Kumihimo Kit and for the PIP Bead Kumi Bracelet and Neckpiece Kit. 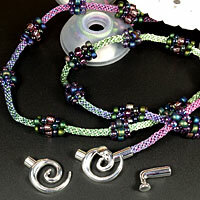 The smaller sets areperfect for bracelets, the larger ones for neckpieces.